Mother Teresa was someone I knew ever since I was a kid. I didn’t get to see her in action because she died around the same time I was old enough to receive first communion, but her legacy lives on in the Missionaries of Charity. I’ve mentioned before that I kind of fangirl whenever I see sisters wearing the blue and white habits because to me, they represent Mother Teresa. 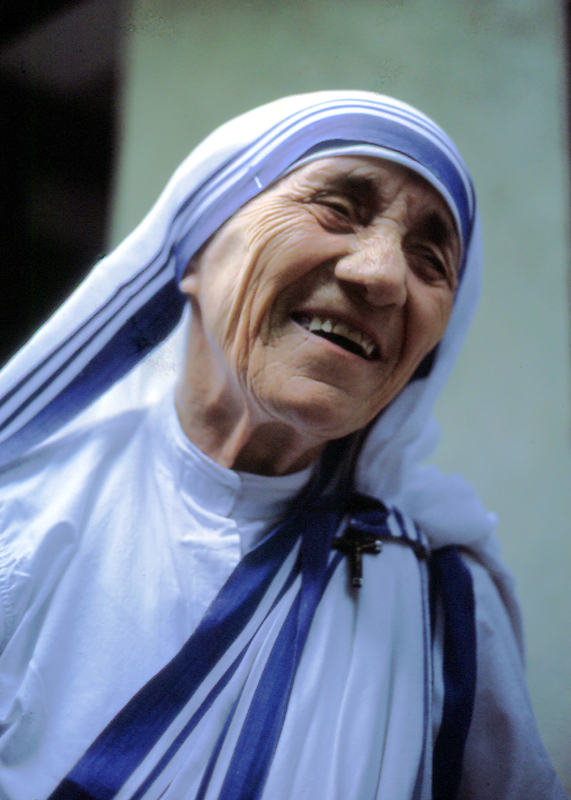 In contrast to certain other people who claim to preach God’s word while their actions indicate otherwise, Mother Teresa serves as a great example of how the Catholic faith is lived out. In Rediscovering Catholicism, Matthew Kelly shares an anecdote from Jim Castle, who encountered Mother Teresa on a flight from Ohio to Kansas. Jim prayed the Rosary with the soon-to-be saint and when the flight was over, she gave him her Rosary. Praying the Rosary led to many graces for Jim and his friends and family, but it never would’ve happened if Mother Teresa didn’t take that opportunity to evangelize. Her evangelization was simple: sharing a moment of prayer with a stranger. It’s definitely something to think about. Times that we would perceive as being inconvenient (long flights, commutes to work) can easily be opportunities for prayer and evangelization if we’re open to that possibility. Another way that Mother Teresa seems to be a great saint for this modern age is her struggles with staying true to God. I’m currently reading her autobiography Come Be My Light and I’m already finding myself relating a lot to her spiritual journey. Creating her own order wasn’t an easy task, nor was organizing the Missionaries once the group was established. But as Bishop Robert Barron pointed out, what makes Mother Teresa stand out the most is how she endured the darkness inside of herself. So many people think that religion and spirituality are supposed to be “feel good” things. In reality, to use a very millenial hashtag, #thestruggleisreal. It’s a constant struggle to stay true to God’s will. What made Mother Teresa extraordinary was that she kept on living her vocation in spite of what she felt. And up until recently, very few people knew of the struggle she lived with throughout most of her life. There are a lot of other things that Mother Teresa taught me. They’re mostly little things. But my favorite thing from her is the “I Thirst” meditation. The word “thirst” is also something that gets used a lot in millenial slang. When a millenial says that “the thirst is real” or someone is “thirsty,” they usually refer to someone being desperate for affection. Mother Teresa, however, understands that the thirst that we have for love is a reflection of Jesus thirsting for our love. Mother Teresa is one saint that I want to model in my life and I can’t wait for her canonization!